Victory Miniatures was formed in 1999 by three modellers. Their concept was to create models not readily available in the market place and mainly following early nineteenth century naval and military themes. The range grows year on year and now includes an exciting range of 150mm models to supplement our existing range of 120mm, 90mm and 54mm models. 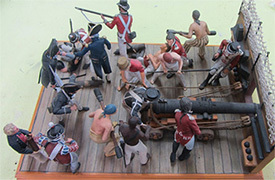 As mentioned the original range consisted of naval themed models and from these it is possible to recreate sea battles such as Trafalgar, as the diorama below illustrates. We now include many different subjects in various scales and should be able to satisfy the modeller with a range that covers from the year 1199 (Richard the Lionheart) to modern day soldiers.